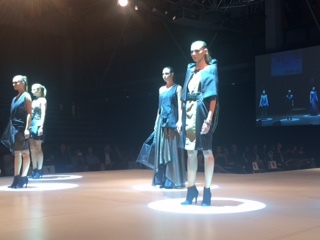 One of the joys of being involved with an event like STYLEAID is that I get invited to attend some truly amazing fashion events and this week was one of them when I was invited to attend “Zenith” the Curtin University Fashion Graduates Show. 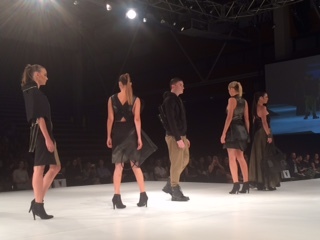 It is so refreshing and delightful to see young designers who are not constrained by commercial interests being able to express their artistic talents in a free flowing way that really allows them to shine. This was a parade filled with extremes in terms of design from the highly tailored to the highly artistic. 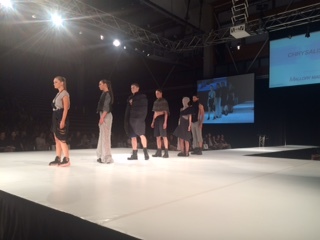 The evening was a real showcase of all of the amazing talent that exists in Perth and is a real credit to the teaching staff at Curtin who have nurtured and fostered some really fantastic new talent! 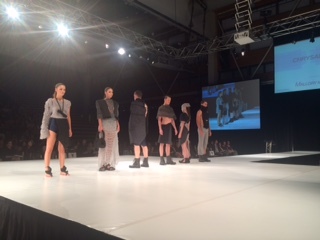 From the opening designer to the final there were some outstanding pieces on show from the young new designers. 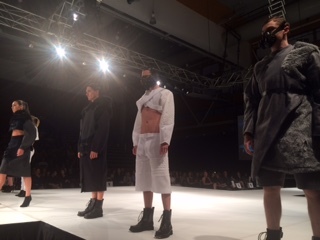 Each designer showed 4 to 8 pieces and their individual talent shone through with each one. Their was the romantic, the practical, the deconstructed, the rough around the edges and the fantastical. All of these elements added up to a show the real, fresh, new talent that is being fostered and I hope that this can transfer for these young designer into a career in the industry that they obviously love. 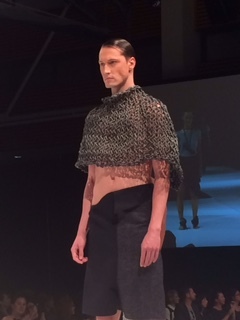 Some of the detail on some of the pieces was truly breathtaking whilst on others the interpretation of their own theme and label name allowed their real design talent to excel and come to the fore. 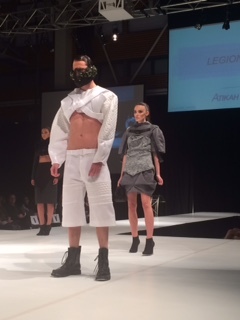 For me there were some designs that stood out more than others in terms of what I like and really enjoyed from a design perspective and others that I was not so enamoured of, but that is the case with any parade – you will always find some designers that resonate and others that don’t. 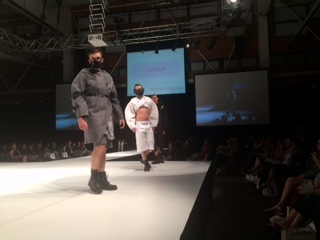 That is the wonderful thing about fashion and with the Curtin Grad Show you will always get the full spectrum of designs to thrill and delight. 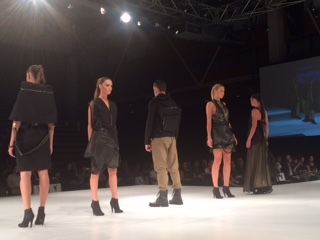 Melanie created a very clever practical collection that did answer the above questions and juxtaposed bags into dresses and vice versa. 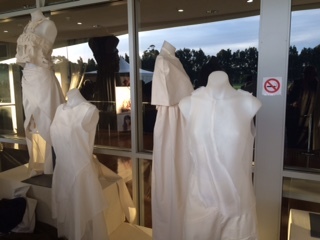 It was inspired, delightful and visually exciting trying to work out where the bag started and the dresses finished. Giving each of her designs character names that encompassed strength, bravery, loyalty and nobility that combined to be united as one. 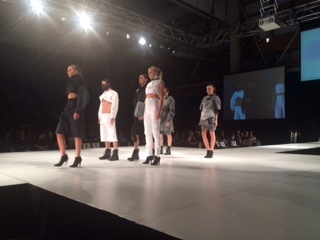 This was a really cool collection that could be transferred into a saleable collection, perhaps not here in Perth but I could see it work really well in Japan for example. Sheona Cowden – Doe Eyed. 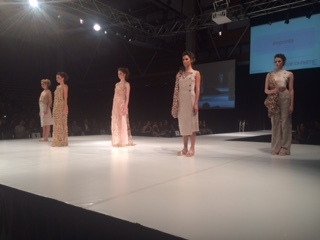 Here was a collection that combined a multi-layered process in light delicate hues to create a wonderful collection. Very feminine and highlighting the female form to perfection using woven organza, crepe de chine and silk. 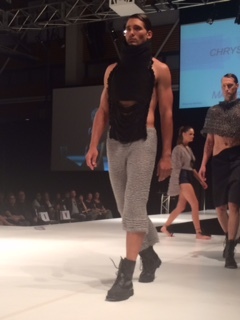 “This collection reflects the multi-layered process of unveiling inner beauty, a journey of self-awareness. The translucent layers of intricately woven organza are a second skin and a slow unfolding of my self-discovery. Hundreds of threads form an open mass, moving and flowing over the face in an attempt to hide from self-realisation,” she explained. Jayde even created her own shoes for her collection as a reference to the metaphoric significance of the footprint in our lives. 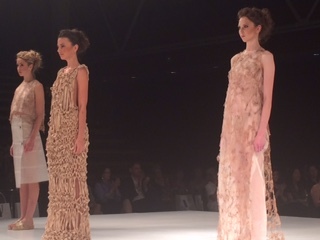 I especially loved the hand woven bags and the delightful woven floor length dress, truly inspired and original. Finally there was Mallory Maduka-Ike – Chrysalis. 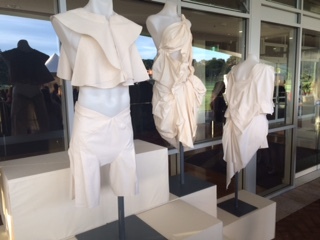 Working with the notion of changing from one form to another this collections used the cycle of the butterfly for inspiration. “I am inspired to investigate the application of this amazing process tof transformation on the human form, taking the idea of a human chrysalis, peeling back the layers of us to find what is underneath. In the chrysalis stage the caterpillar dissolves itself, down to its imaginal discs, which contains cells for each new body part. My intention is to cocoon the boy and realise what we could be. 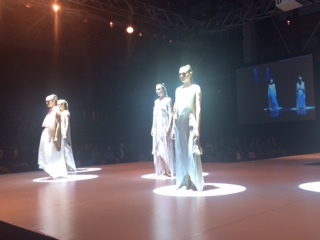 This collection was pure fantasy and form that combined to create the real sense of drama and beauty that combines for the process of emergence. 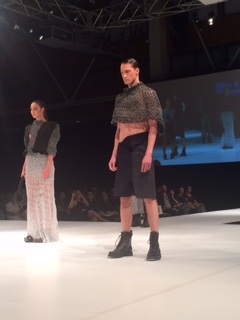 There were of course many other final year student designers who shared their creative visions but the above 5 are the ones that really spoke to me and the ones that I really enjoyed seeing on the catwalk. 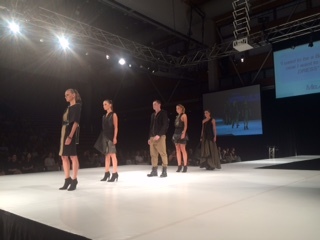 This was a triumph of grand new designers and I wish them luck with their future endeavours…the landscape looks bright for WA Fashion.